Line 13x9-inch pan with foil; butter foil. In large bowl, mix melted vanilla baking chips and 1 can of the frosting until well blended. Spread 1/3 of mixture evenly in pan. In another large bowl, mix melted butterscotch chips and second can of frosting until well blended. Stir in 1/2 teaspoon yellow and 1/2 teaspoon red food color until mixture is orange and well blended. Spread orange mixture over white layer in pan. If remaining 2/3 of white mixture has set up, heat in microwavable bowl in microwave on medium-high for 1 minute until melted and smooth, stirring occasionally. Stir in 1/4 teaspoon yellow food color until mixture is bright yellow and well blended. Spread over orange layer in pan. Refrigerate until firm, about 1 hour. Use foil to lift candy from pan. Turn white side up; peel off foil. Cut into 8 rows by 6 rows. 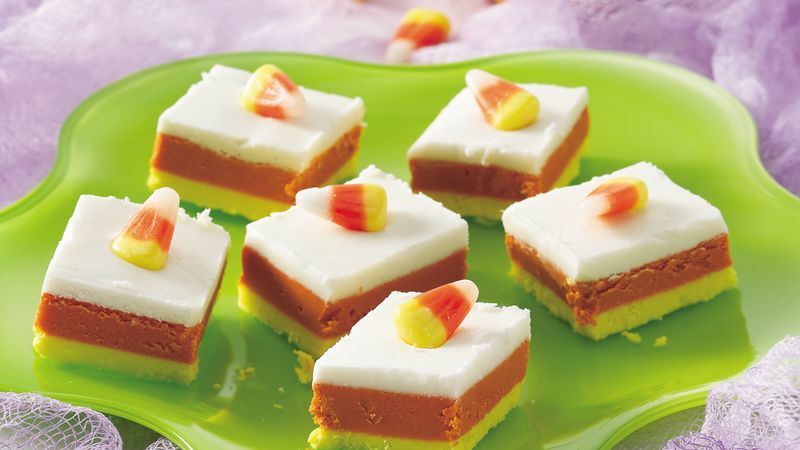 Press 1 piece candy corn in center of each candy. Store in refrigerator. For a more intense orange color, use 1/4 teaspoon orange paste icing color in place of the liquid yellow and red food colors.